Here’s an Application Note about a very fast SIP electro-mechanical relay that I find useful for amateur radio applications. It’s very fast, usually less than 300us to actuate or release, so it’s good for CW or FSK keying of transmitters. I suspect that relays similarly constructed will have similar characteristics. Want a PDF of the info on this page? If so, click here! Very fast relays can be of benefit to amateur radio operators, specifically in controlling the keying circuits of a CW (Morse Code) or FSK (Radio Teletype) radio transmitter. This report presents some test data indicating that the operate time and the release time of this relay is less than 300 us. This limited test report provides some measured data on time to actuate and time to release the contacts of a Pan Chang SIP-1A05 relay, a SPST SIP relay with a 5VDC coil. These relays are (currently) available on Ebay for about 60 cents each when purchased in quantities of 10 or more. The coil resistance is approximately 510 ohms and the resulting coil current with 5VDC applied is approximately 9.8 mA. Figure 1. Photo of Pan Chang SIP-1A05 relay. Ruler graduations are on 0.1 inch centers. Coil is on inner pins, contacts are on outer pins. The test circuit used for measurements is shown in Figure 2 below. 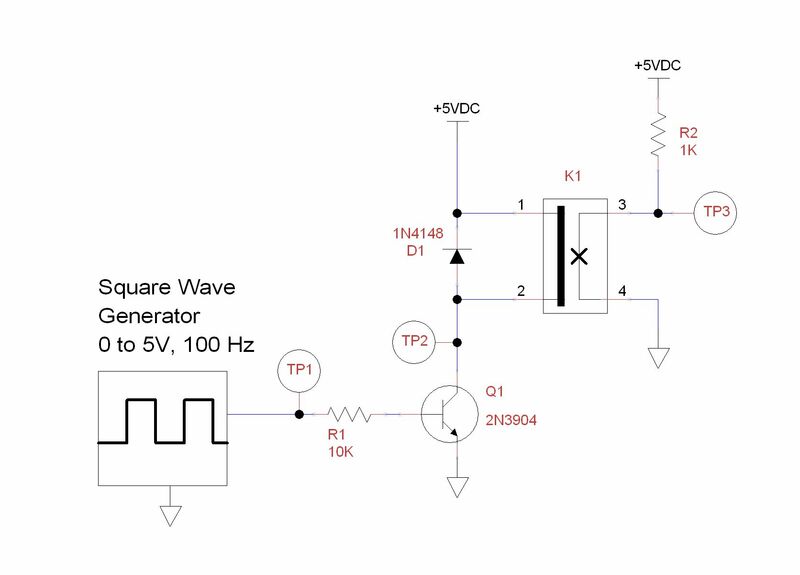 A Tektronics FG501A waveform generator was used to produce a 100 Hz square wave with 0 to 5V output, which was connected to TP1. A Hantek DSO5202P digital sampling oscilloscope was used as the measurement device. Channel 1 input was connected to TP2 and channel 2 input connected to TP3. The oscilloscope was adjusted to trigger on channel 1 (TP2) on either rising or falling edge of the square wave signal. The delay through Q1 (TP1 to TP2) was measured at less than 1 us. Below is Figure 3, which is a plot of the waveform of the signals at T2 (upper) and T3 (lower) when the relay is actuated. In Figure 3 the vertical graticule marks 20 us increments. The leftmost vertical cursor with 121 us at the top marks the time when trigger occurred, which was 121 us prior to the vertical centerline of the display. Additionally, it coincides with the collector of Q1 going to ground and current beginning to flow through the relay coil. The “dt” value shown in the lower right gray portion of the screen is the time between the first vertical cursor and the second (E) vertical cursor, 266 us (the time to first actuate the relay contacts plus the time needed for the contacts to settle). Below is Figure 4, which is a plot of the waveform of the signals at T2 (upper) and T3 (lower) when the relay is released (coil de-energized). Note that in Figure 4 that the release time is 112 us and the relay contacts appears to have little, if any, bounce. When the relay is de-energized the collapsing magnetic field can produce a large voltage “kick”. Recall the axiom that “current through an inductor can not change instantaneously”. If the relay coil current is 10 mA right before the driver cuts the current to the coil, and the load resistance across the coil goes from, say, 10 ohms to 1,000,000 ohms when the driver shuts off, then the voltage, for an instant, across that very large load resistance must go up proportionally (V = 10ma x 1 M ohms, which is a BIG value). There are circuit losses that will limit the voltage, but for a few nanoseconds that voltage kick can be large, large enough to zap the transistor driving the relay coil. For that reason, a reverse biased “snubber” diode (D1), is often placed across the relay coil. With the diode in place the current from the collapsing magnetic field of the relay coil will continue flowing through the diode, until the field is greatly diminished, effectively eliminating the excessive voltage kick. However, because of the diode, the relay coil current, although rapidly diminishing, will continue to flow after Q1 is in cutoff, and thus it will take longer for the relay contacts to release than it would if the diode was not included in the circuit. Figures 5 and 6 below show the effect of removing the snubber diode from the circuit. In Figure 5 above, the snubber diode has been removed from the circuit and now the release time has dropped to 10 us (down from 112us with the snubber diode installed). But look at the upper trace, TP2, the collector of the transistor driver Q1. 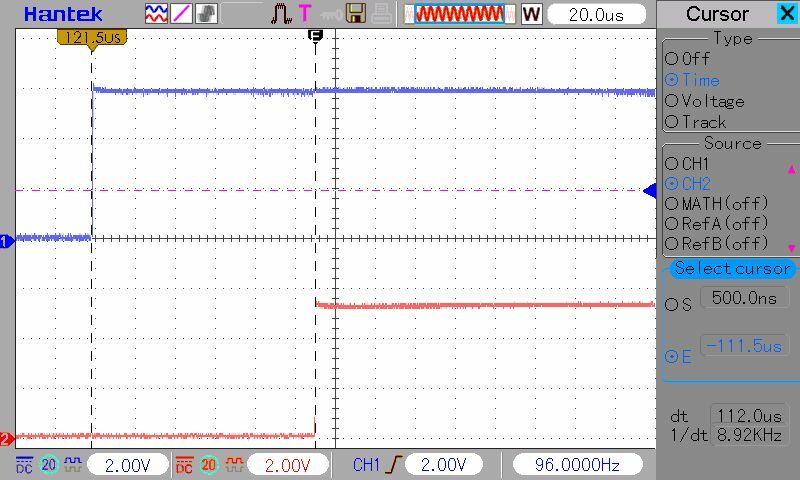 In this test case the voltage scale for the upper trace of the oscilloscope (T2) was increased to 50V/division and the measured“kick” extends to about 80 volts. When viewed on an analog oscilloscope high frequency ringing can sometimes be observed for about 5 us after Q1 is cutoff. I suspect that Q1 is breaking down on the voltage peaks and limited those voltage peaks to a lower value than they might otherwise be. Over many relay actuations and releases, those voltage spikes would likely damage Q1, the relay driver. 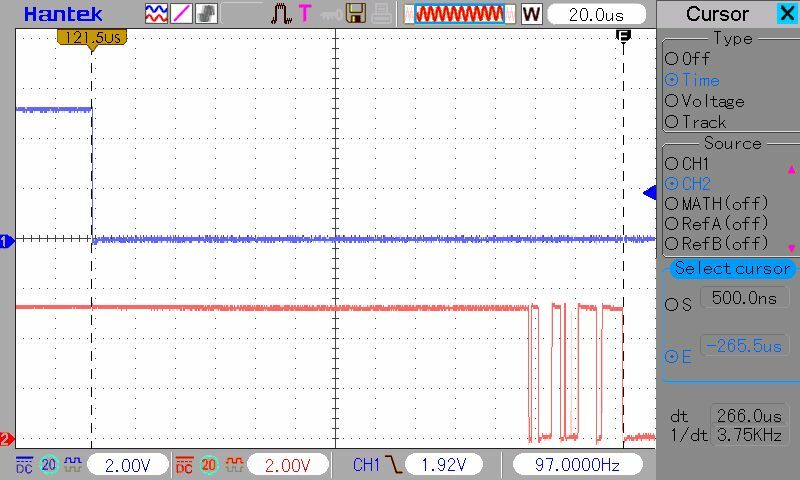 So we choose to accept extended relay release time due to the snubber diode, as a cost of protecting Q1 from damage due to voltage spikes. Figure 6 shows the actuation timing with the snubber diode removed. With the diode removed the actuation time is now 256 us (down from 266 us with the snubber installed). To be frank, I don’t know why the actuation timing would be slightly less without the snubber diode since three shouldn’t be any current flowing through the diode during coil activation. I’ll need to discuss that issue with an applications engineer at one of the relay manufacturing companies to learn about the mechanism causing that phenomenon. Overall, the speed of the relay to operate and release, even with a snubber diode across the relay coil is always less than 300 us including contact bounce time during activation. There does not appear to be any significant contact bounce on deactivation of the relay. 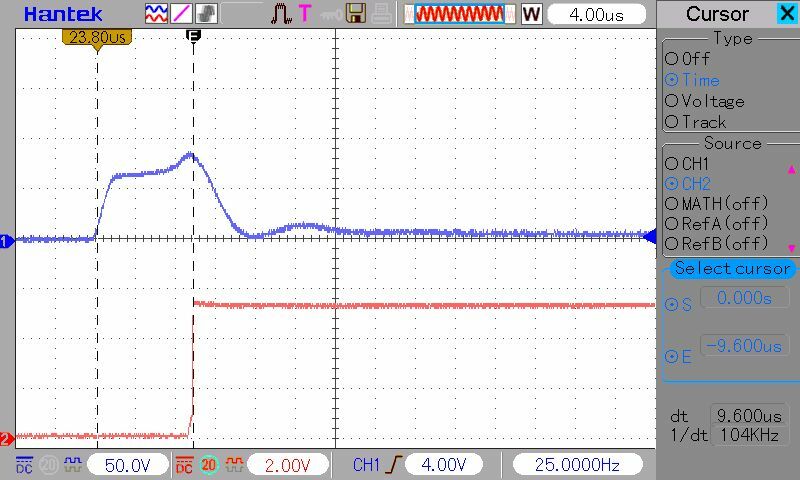 Removing the snubber diode significantly reduces deactivation time at the expense of large voltage spikes across the relay driver element.